During the period covered by this fourth volume of letters, Howard Phillips Lovecraft resided quietly in Providence, Rhode Island amidst a society then languishing under the ravages wrought by the great depression. At the beginning of this period, in January 1932, Lovecraft had been living frugally in a boarding house at 10 Barnes Street with his elder aunt, Lillian Clark, but after Mrs. Clark’s demise he was impelled under the pressure of poverty to combine households the following year with his other aunt, Mrs. Annie E. Phillips Gamwell. Not a great deal had remained of the old family of Whipple Phillips, but the two surviving members and their residual possessions were now comfortably accommodated on the upper floor of the residence at 66 College Street. 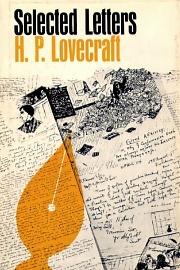 Apart from occasional antiquarian excursions or festive reunions with the New York Kalem Club, Lovecraft essentially maintained the existence of the scholarly recluse—writing an infrequent story, revising the work of others, but more often embarking upon brillian epistolary voyages to his ever widening circle of correspondents. Even though beset by uncertainty over his own creative work, Lovecraft had now attained a peak of intellectual maturity as evinced through his profound letters to E. Hoffmann Price on the aesthetics of literature, his blazing debate with Robert E. Howard on civilization versus barbarism, or his trenchant commentary to Clark Ashton Smith on the art of weird fantasty. Here too are contemporary accounts of Lovecraft’s travels in New Orleans and Quebec, his collaboration on Through the Gates of the Silver Key, a dinner engagement with A. Merritt, reminiscences of Henry S. Whitehead, formation of the Kappa Alpha Tau fraternity, plus hundreds of other subjects detailed in letters which preserve the innermost thoughts and dreams of the renowned twentieth century American fantaisiste. Selected Letters IV (1932-1934). By H.P. Lovecraft, Edited by August Derleth and James Turner. Sauk City, WI: Arkham House Publishers, Inc.; 1976; ISBN 0-87054-035-1; Hardcover. This book may be purchased in hardcover from Amazon.com or Barnes & Noble or directly from the publisher, Arkham House.